Today's dinner was courtesy of Food Gal's Thomas Keller "Ad Hoc at Home" preview, with some inspiration drawn from Brian Boitano's scallops with mango and avocado. Who knew Brian Boitano cooked, right? I had no idea scallops could be caramelized. I'm always afraid of overcooking them. That happened to me once in a teppanyaki restaurant and it was so very disappointing. Rubber seafood is about as bad as it comes. Worse than rubber chicken. Reading through Food Gal's comments I found that the original recipe of 10 total of water cups and the cup of salt could be halved, especially since I was only making a small test batch just for me. I pretty much followed the directions exactly, except for using table salt (at a ratio of 2/3 cup of table salt = 1 cup kosher salt) and only having the 4 scallops instead of a pound. I also cooked them in a cast iron skillet. They came out perfectly. It's important to note that if you attempt this dish, you should definitely read Food Gal's post first. She does a great job explaining the entire recipe. This was also my first time making clarified butter for the sear. It's readily available in southeast Asian stores, but it's so simple to make, and I only needed a small amount, that I tried my hand at it. For details on how to make it, see the Asia Recipe website. Finally, I didn't see the point in cutting the wonton wrappers into circles, so I simply fried them as squares. Yes tostadas are circular, but that's just an unnecessary step. The sear on the scallops was unreal. And they were perfectly cooked, no rubber! The combined recipe below was scaled down for a single serving. 1. Line a small baking sheet with paper towels. Combine the 1/3 cup salt with hot water in a large bowl, stirring to dissolve the salt. Add the cold water. 2. Add scallops to the brine and let stand for 10 minutes. 3. Drain the scallops, rinse under cold water, and arrange in a single layer on the baking sheet. Cover with more paper towels and refrigerate for 1 1/2 to 3 hours (no longer, or the quality of the scallops will be affected). 4. While scallops are resting in the fridge, work on the relish and tostadas. In a medium pot, bring 2 cups canola oil to 350 degrees F. Fry the wontons in small batches until they are brown and crispy, about 2 minutes. Drain on a plate lined with a paper towel and season each with a bit of salt. 5. In a medium bowl, combine the diced mango and avocado. In another smaller bowl, whisk together the crema, hot sauce, and lime juice, and adjust the seasoning with the salt and black pepper mix, to taste. Pour half of the creamy mixture over the mango and avocado and gently toss to coat. 6. After the 1 1/2 to 3 hour rest period, heat a generous film of clarified butter in a large cast iron frying pan over medium-high heat until it ripples and begins to smoke. Sprinkle scallops lightly with salt and add them to the pan. Cook, without moving the scallops, until bottoms are a rich golden brown, 3 to 3 1/2 minutes. Turn scallops and caramelize the second side. 7. 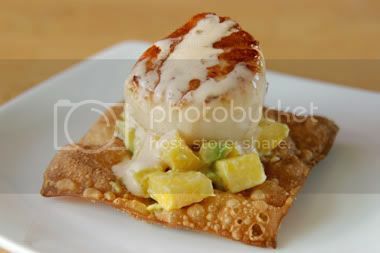 To assemble, put 1 tablespoon of the mango and avocado mixture onto a fried wonton. Top with a caramelized scallop and finish with a squeeze of lemon juice (optional) and a drizzle of the crema sauce. This looked like a LOT of food on the plate. But when I was done, I wanted more. I don't know if it was just too little food, or it was so good it left me wanting more. I'm going with the latter.